The 27-year-old singer, who has Barbadian and Jamaican ancestry, found fame on the 2011 series of Britain's The X Factor alongside Jade Thirlwall, Perrie Edwards and Jesy Nelson. However, in the beginning of the British girl group, Leigh-Anne struggled to find her identity, and would often cry because she didn't think she was as popular as her bandmates. "During the first couple of years of being in the band, I did feel invisible. I remember crying to my manager regularly, I just couldn't seem to find my place and didn't know why," she confessed to ASOS magazine. "I didn't feel like I had as many fans as the other girls. It was a strange feeling. I never thought that it was because I was the darkest member of the band. I felt overlooked. So I did everything to make myself more noticed, convinced I wasn't good enough." She also recalled how she was told by Frank Gatson, Beyonce's creative director, that she would have to work twice as hard as "the black girl" in the group. 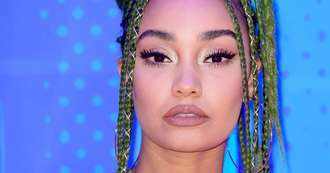 Leigh-Anne has started to accept herself more in the past year, as she has been educating herself with books on racism and prejudice, and has noticed a change in the way society talks about racism. "Now I don't feel alone because I've seen lots of women speak out about this,' she explained. "I know there are girls of colour out there who have felt the same as me. "We have a massive problem with racism which is built into our society. It's scary. But the more people that speak out, the more change we can start to make." The girls recalled how they have also battled sexism, revealing that they were told by executives in the beginning that they shouldn't be writing their own songs or have any input in their music videos. "Years ago we went to a radio event in America, full of VIPs. Someone from our US label Columbia said, 'Go and flirt with all those important men.' I was like, "f**k off." Why have I got to go in and flirt to get my song on the radio?'" Jade said.